Looking for something to spark conversation on the golf course while sinking some truly brilliant putts? 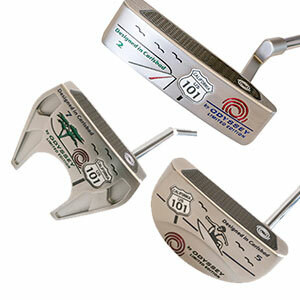 Then Odyssey’s limited edition Highway 101 putter range will be right up your fairway! California, home of warm weather, yellow beaches and now one of the best golf putters to ever grace the golf course. Odyssey, also native to California, has worked tirelessly in its advancements of putter technologies to refine their ranges, and the Highway putter looks to take golfing to the next level. This limited design comes with an aesthetic design in tribute to the 101 highway in California and features the latest sound chamber and face insert, plus a highway themed head cover and genuine Cabretta leather red midsize Master Grip with black baseball stitching. All Odyssey Highway 101 putters have a key technology which makes them perform to optimal standard – an exclusive Sound Chamber which sits behind the Metal-X steel insert. It has been designed to give you a crisper sound and feel at point of impact. The Odyssey Highway 101 range is available now at American Golf. See more from Odyssey Golf.